Takuichi Fujii, a Seattle resident before WWII, drew and painted throughout his incarceration in the Minidoka camp in Idaho. Barbara Johns has brought his works back into public view with the help of Fujii’s family. In 1906 Takuichi Fujii left Japan, came to America and made a life. He boarded the Shinano Maru in Kobe and three weeks later landed in Seattle, still a raw young town just half a century old. He started a business, and a family — a wife and two daughters. And he worked every spare moment on his art, meeting with and learning from his fellow immigrant artists, taking field trips to Eastern Washington to paint. He was asked to mount a solo exhibition by the Seattle Art Museum, a singular honor for any artist, though his move to Chicago for a couple of years put those plans on hold. Then Fujii came back to Seattle and ran headlong into history. Fujii and his family were swept up by Executive Order 9066, issued after the attack on Pearl Harbor, directing that all West Coast residents of Japanese descent be sent to internment camps for the duration of the war. Like other Seattleites, the Fujiis were sent first to temporary barracks at the Puyallup state fairgrounds, then a permanent camp in Minidoka, Idaho. Fujii, 50 when the war broke out, lost almost everything — his livelihood, his home, any sense of privacy, continuity or hope for a better future. 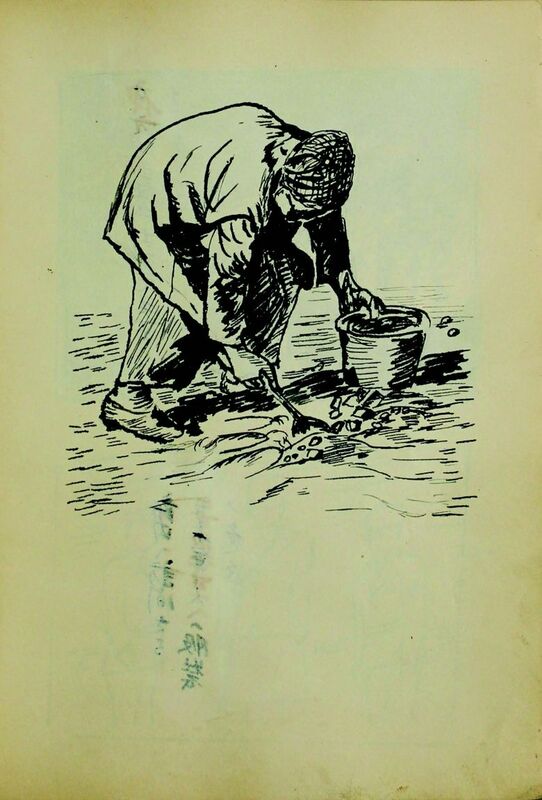 The author of “The Hope of Another Spring: Takuichi Fujii, Artist and Wartime Witness” will discuss her book at 7 p.m. Sept. 13 at the Seattle Public Library’s Central Library Branch, 1000 Fourth Ave. The Washington State History Museum in Tacoma will present Fujii’s work in the exhibit “Witness to Wartime: Takuichi Fujii”, Sept. 21-Jan. 4, 2018. 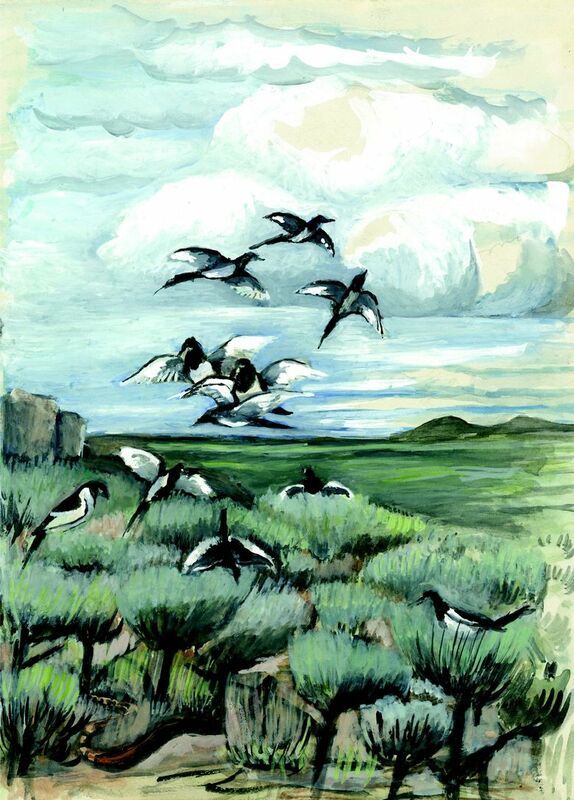 Fujii drew and painted throughout the three and a half years of his incarceration, and his work is featured in a powerful new book, “The Hope of Another Spring: Takuichi Fujii, Artist and Wartime Witness” by Barbara Johns (University of Washington Press, 334 pp., $39.95). It will be the basis for an exhibit at the Washington State History Museum in the fall. The book is a beautiful display of Fujii’s work, and it’s proof of the power of art and artists to witness events many would rather leave in the dark. Roger Daniels, noted historian of the internment, calls Fujii’s work “the most detailed and informative work produced by an Issei prisoner in a War Relocation Authority Camp.” And it’s a testament to the efforts of many people, including Fujii’s grandson and his grandson’s wife, to ensure that his work is not forgotten. Johns, an art historian who lives and works in Seattle, was working on her dissertation at the University of Washington, focusing on immigrant-generation artists in 1930s Seattle, when she first came across Fujii. The artists she studied were interned, but most came back to Seattle. Fujii, on the other hand, “seemed to disappear,” she remembers. Then, in a sequence of serendipitous events, Johns connected with Fujii’s family. Terry Kita, married to Fujii’s grandson Sandy Kita, saw a notice of a federal grant awarded to Seattle’s Wing Luke Museum to restore one of Fujii’s paintings. When the Kitas connected with Johns, she heard extraordinary news — Sandy Kita, an art historian and scholar who had grown up in the same house with Fujii in Chicago, was finishing a translation of his grandfather’s diary, which Fujii kept during the entire internment, using drawings and words to record events. Fujii had died in 1964, but his wife lived into the 1990s, and his wife and a daughter (Sandy’s mother) kept the art collection intact, in boxes. Sandy and his wife found the work when his mother moved from her home into an apartment. 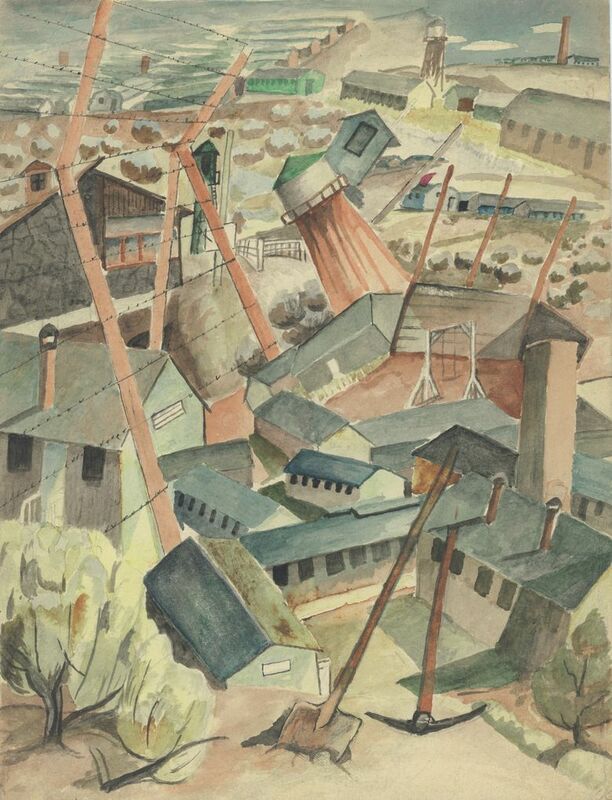 Taking photographs in the camps was banned, but drawing and painting were permitted. Fujii’s diary documented the stark environment, the enforced inactivity, the lack of privacy, the endurance of the extremes of cold and heat in substandard housing — at Minidoka, temperatures could range from 40 below to above 100 degrees. It chronicled the erosion of family life as the younger people — the Nisei, who were born in America — were encouraged to leave the camps, either to work or join the military. He painted the multiplying graves of residents who died there. 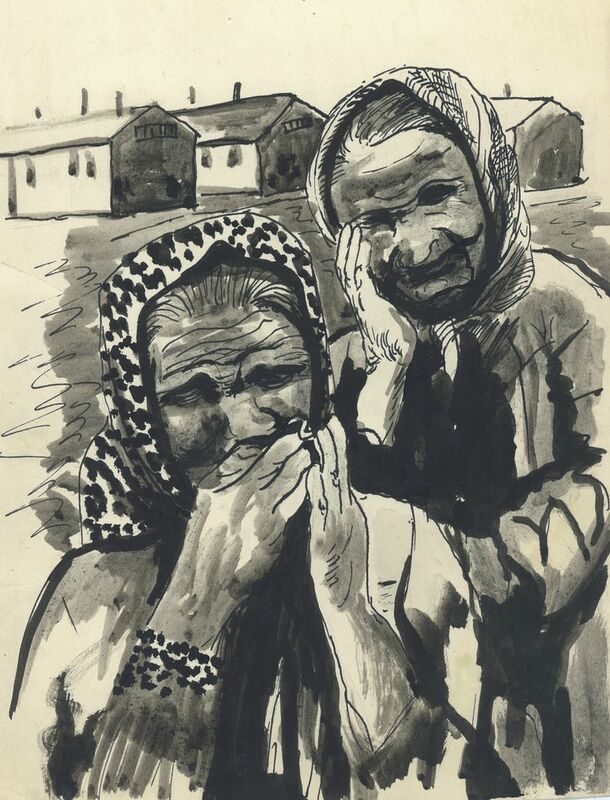 The drawings powerfully conveyed a feeling of threat and despair. 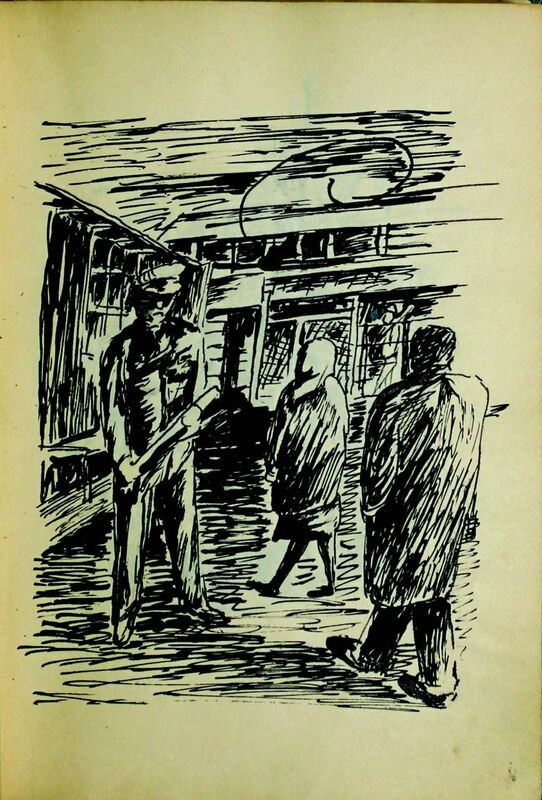 Though the government used euphemistic terms like “colonist” to describe the internees, one drawing of the door to Fujii’s barracks with the lock on the outside showed the arrangement for what it was — a prison. Fujii’s words were spare; as a first-generation immigrant, an Issei, Fujii grew up in a Japanese tradition of emotional restraint. But the pictures told the story. They are powerful, dark and somber — at 50, Fujii had no way of knowing whether he would survive the camps, or whether he would see his daughters, who left for marriage or work, again. 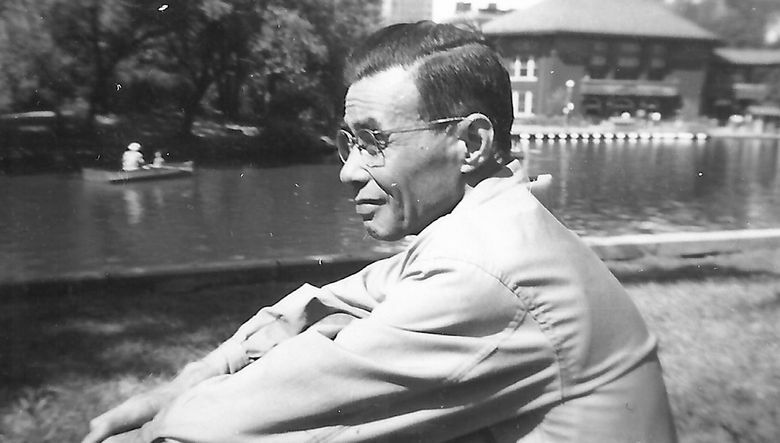 Fujii never came back to Seattle — after the war he moved to Chicago, a new home for many West Coast internees. The diary, drawings and paintings went into storage and might have never have seen the light, save for the resolve of the Kitas. Johns is an admirer of Fujii’s work, but more than that, she admires his persistence, his determination to bear witness to a terrible time. “I think the persistence and resilience he showed was incredible,” she says.